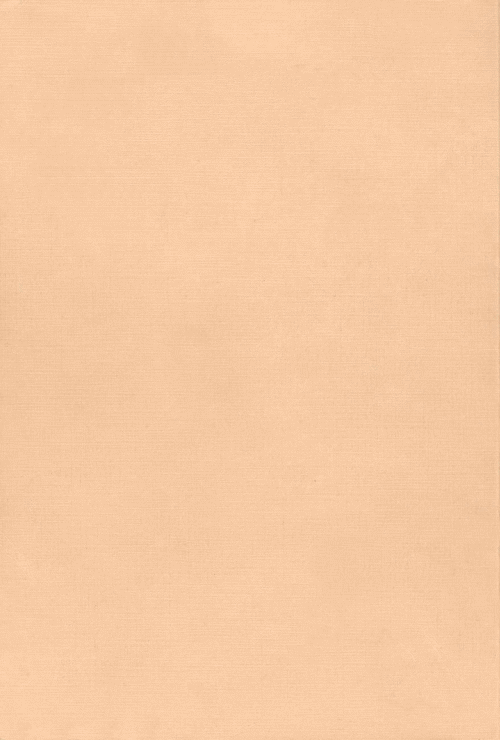 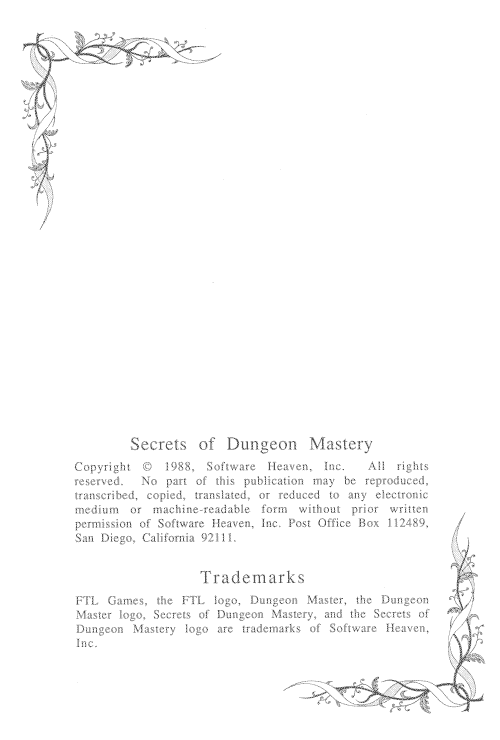 This book is Copyright © 1988 by Software Heaven, Inc. 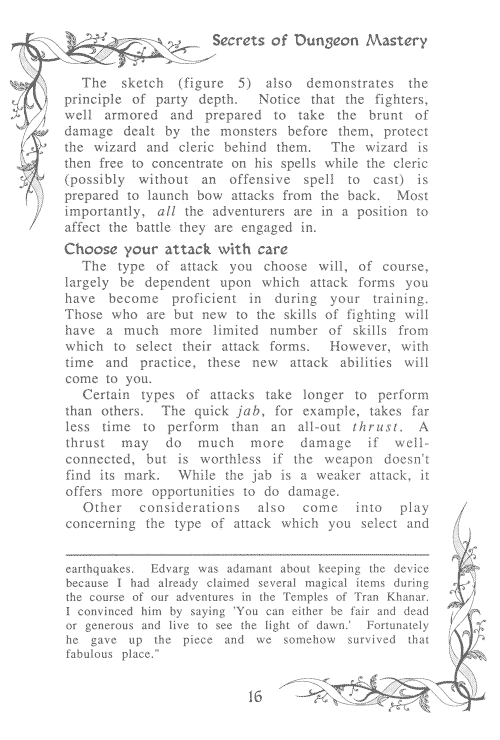 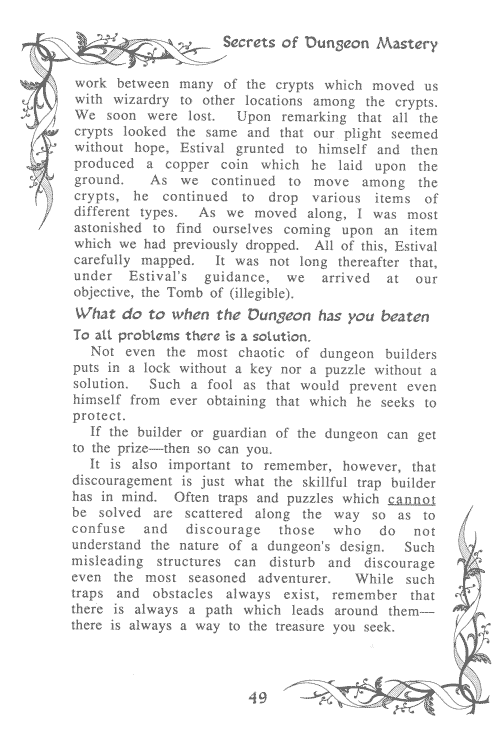 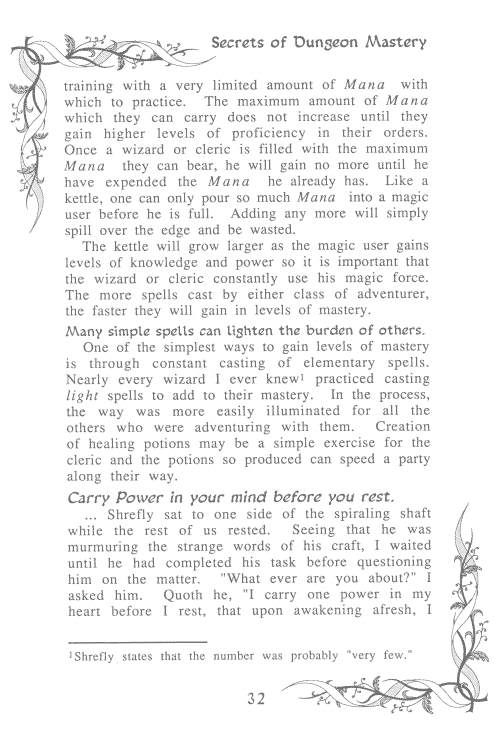 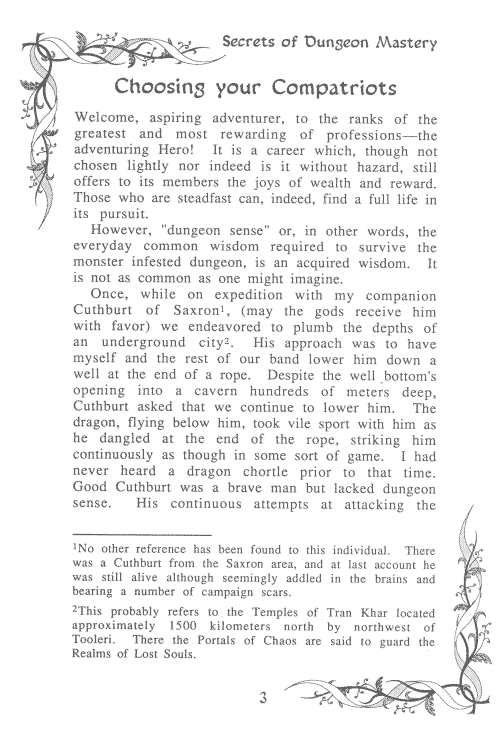 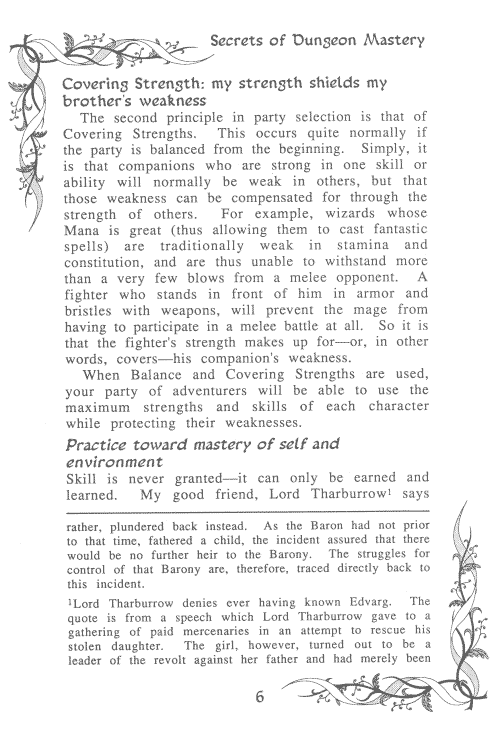 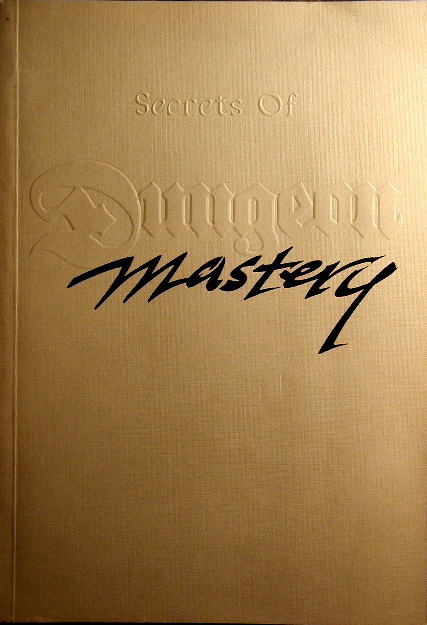 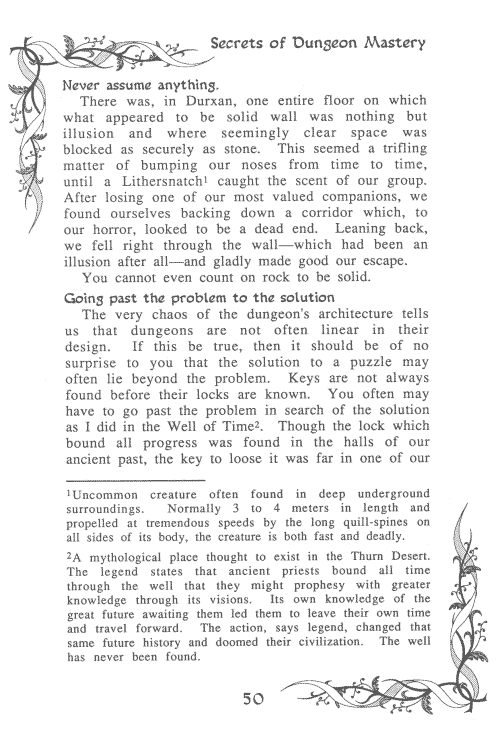 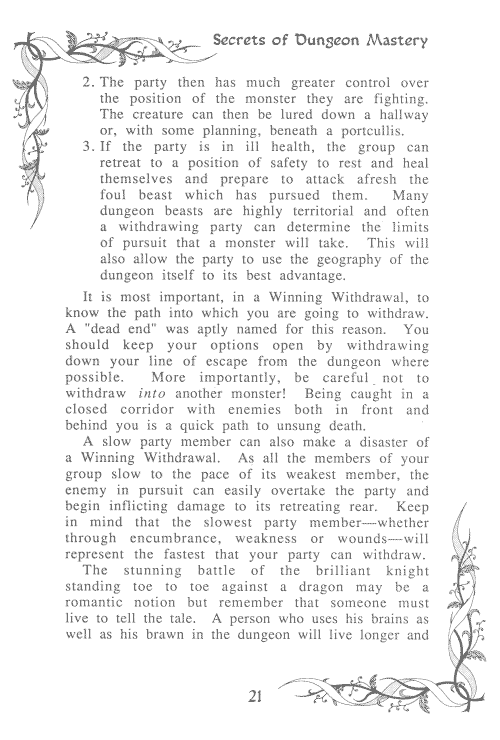 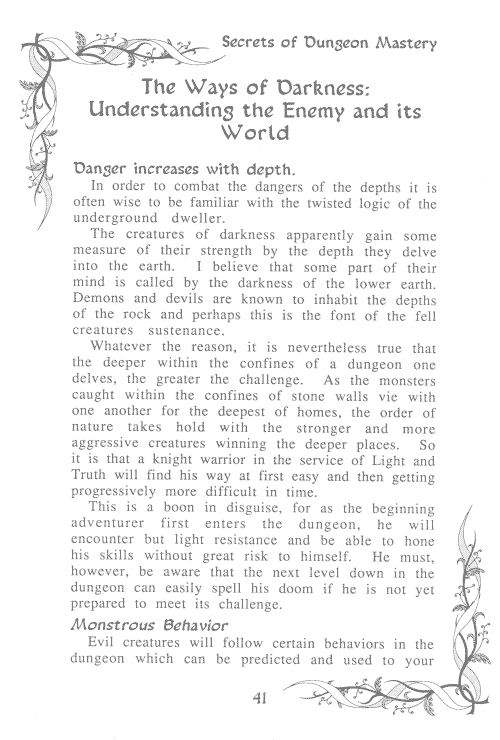 The Secrets of Dungeon Mastery is a 69-page, soft-cover book which aims to give extra insight into the famous and popular game of Dungeon Master and has, so we are told, been compiled by Tracy Hickman from various documents and letters left by Edvarg the Unfailing. 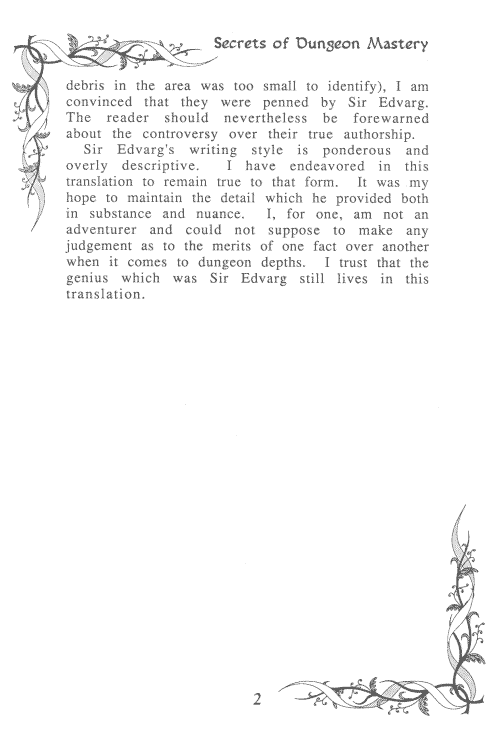 Edvarg was an adventurer who was born in 791 and who started his heroic career when he killed an invading prince to save his mother's honour and ended up a hero of the court and squire to the Lord of Sagnavos. 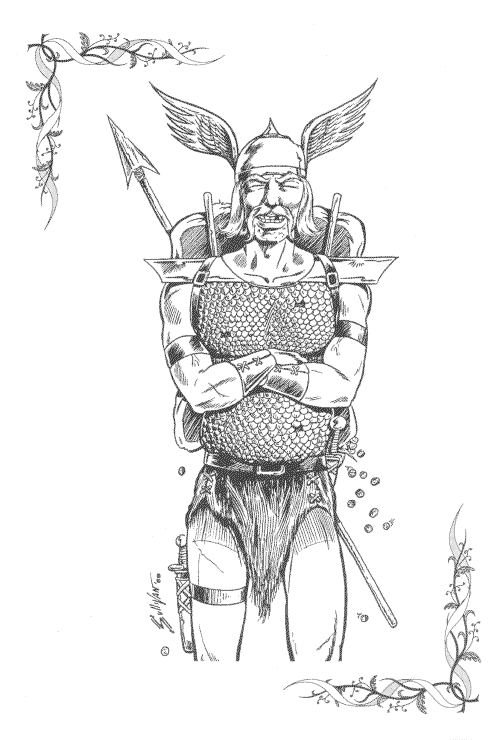 Sadly, after many quests, Edvarg lost his life in the quest for the Firestaff, though if the stories are to be believed, he had already lost his life several times before in other adventures and been revived by his companions, so, who knows, we may not have heard the last of him! 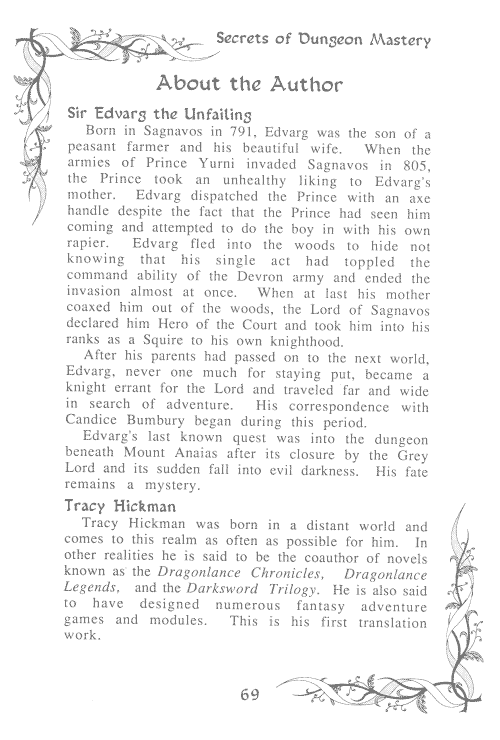 For those of you who aren't familiar with Tracy Hickman, he is one of the co-authors of the Dragonlance and Darksword series of books and related games - if you haven't read them, I can thoroughly recommend them! 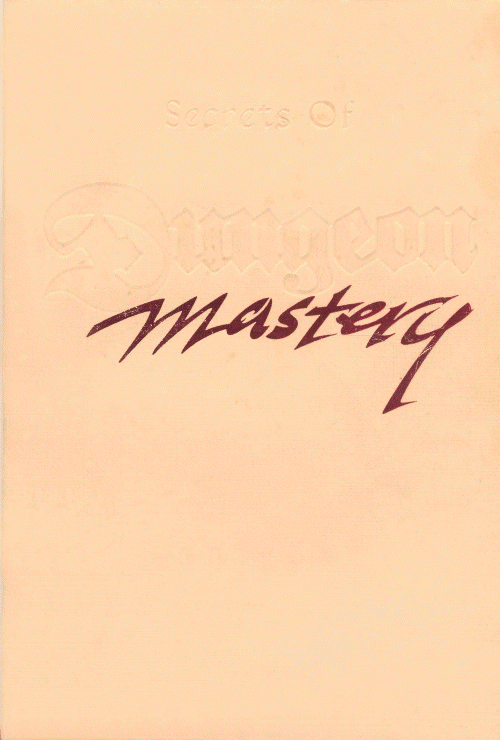 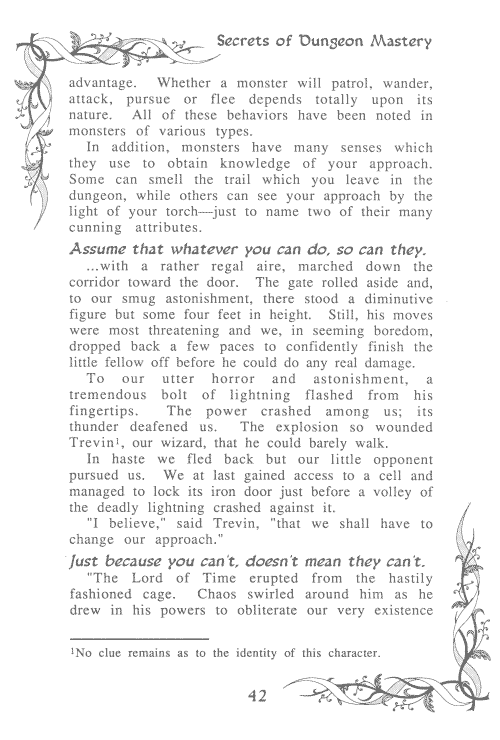 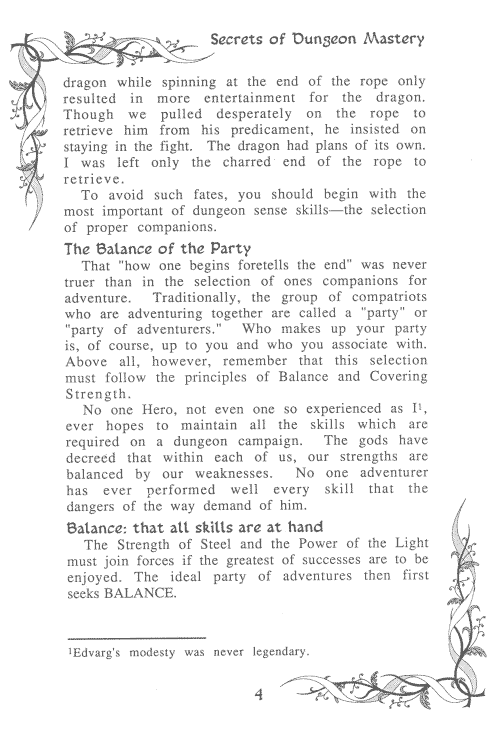 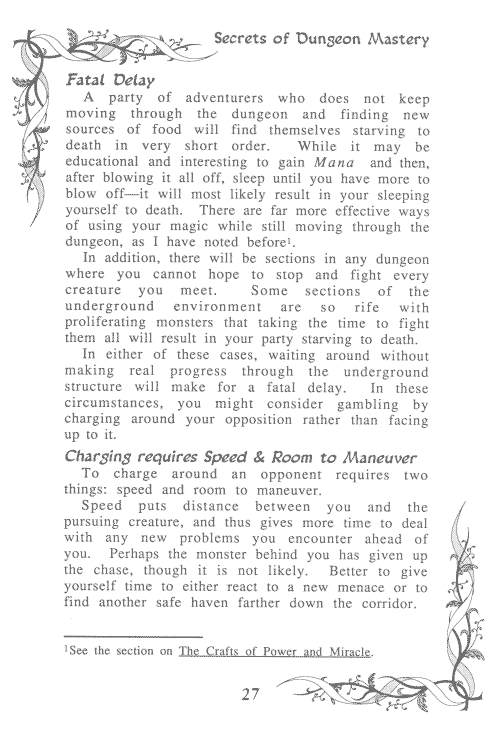 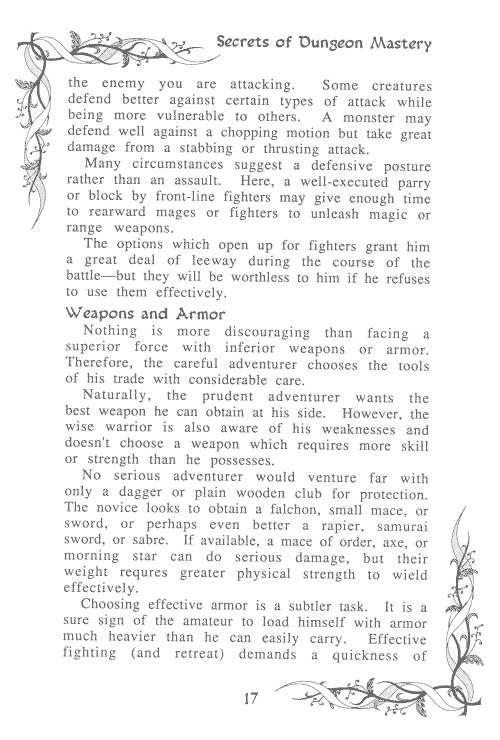 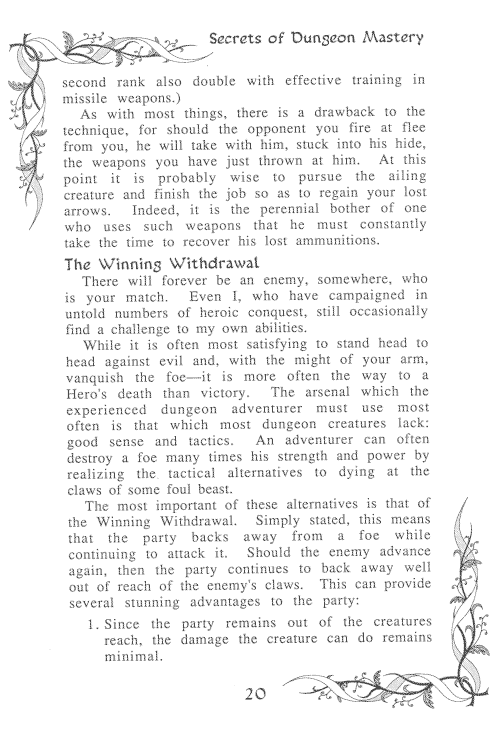 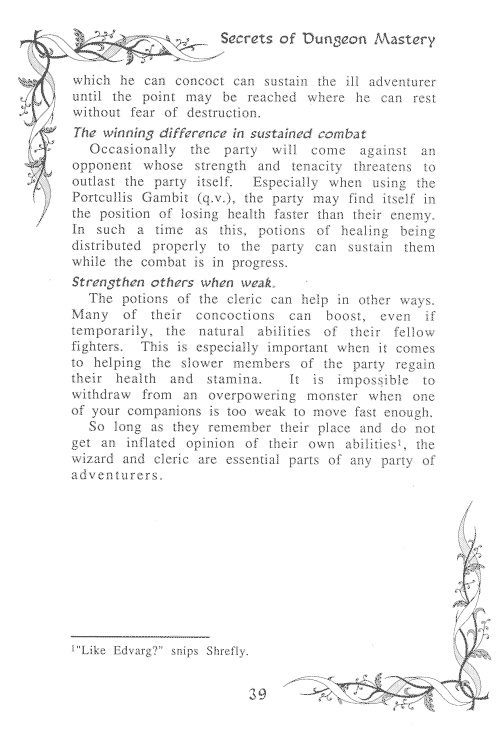 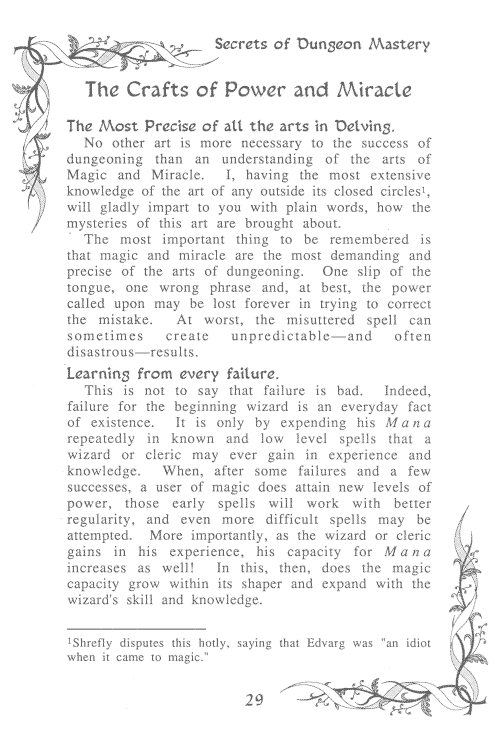 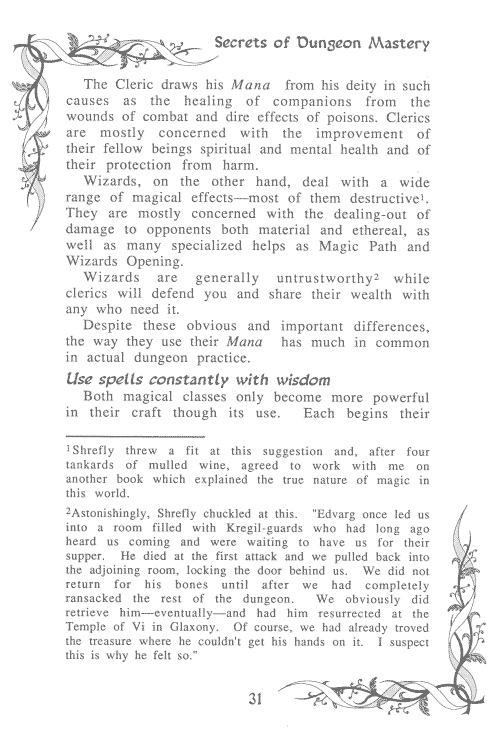 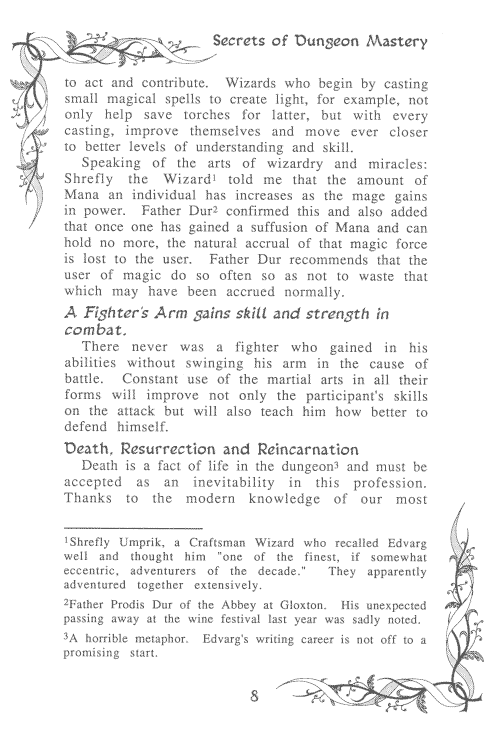 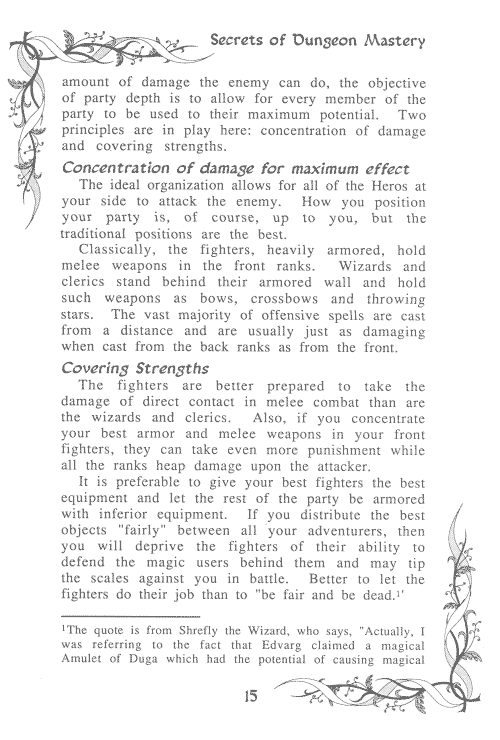 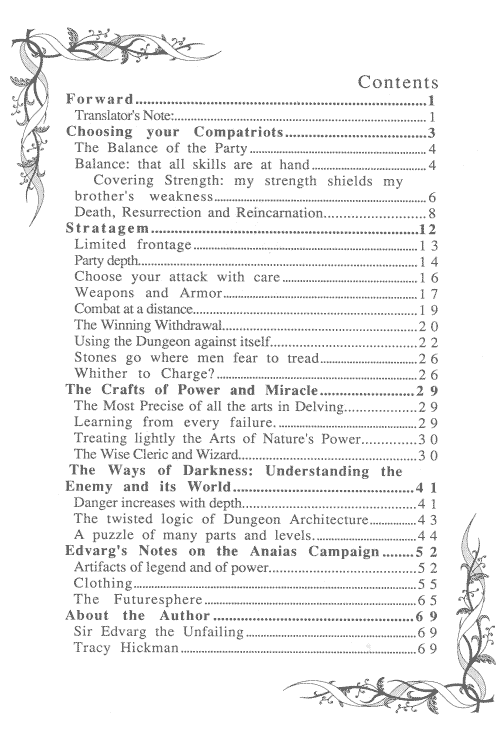 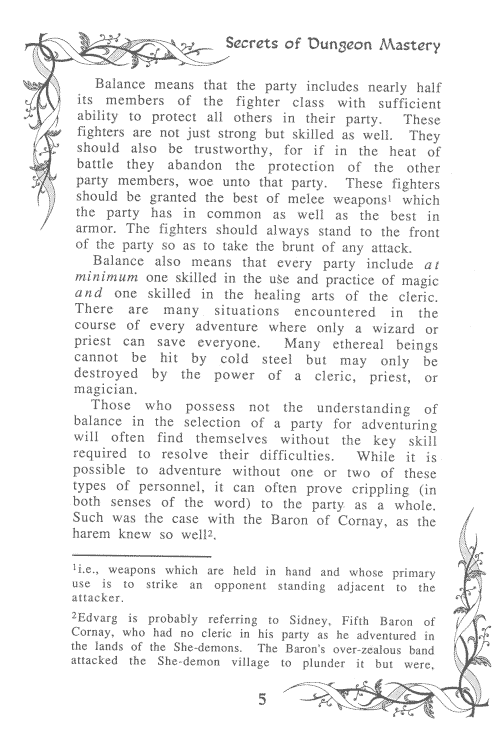 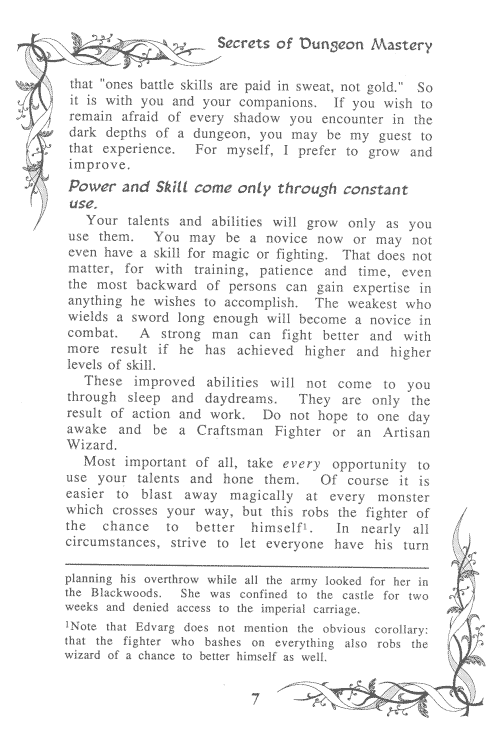 But, back to the book in question which covers many aspects of Dungeon Master, from character selection, strategy and spell-casting to mapping. 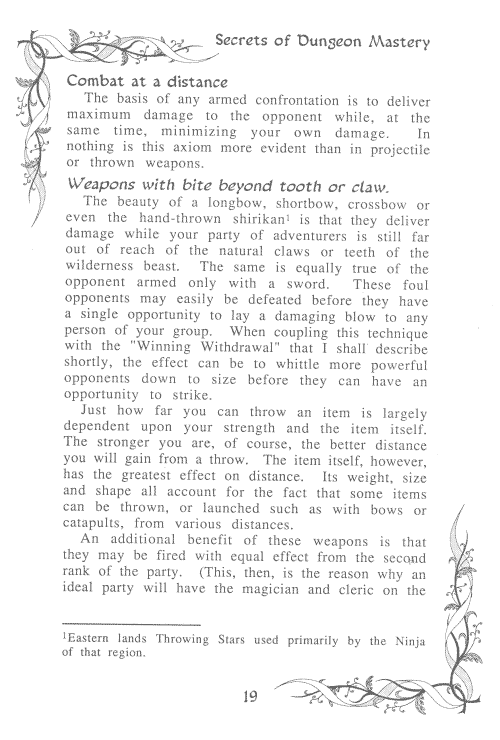 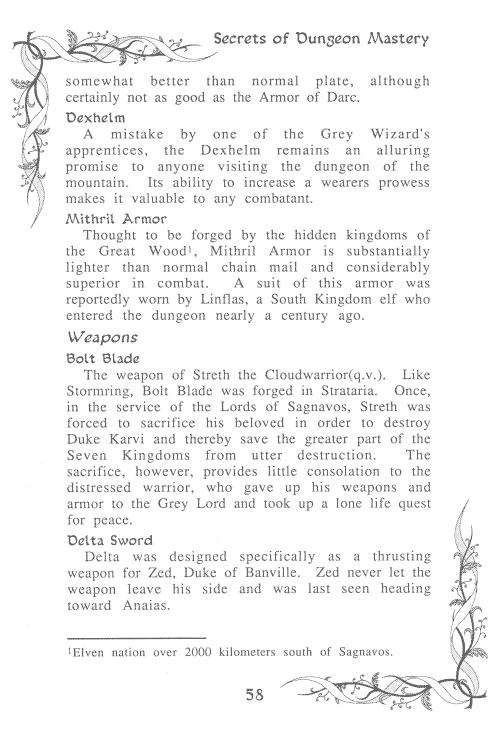 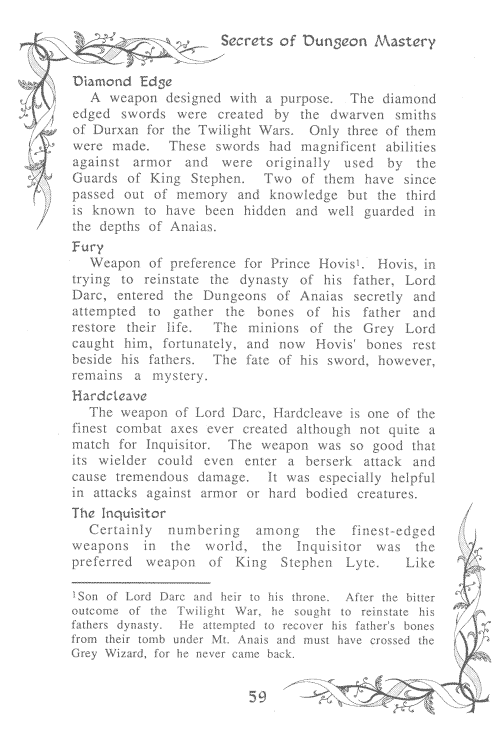 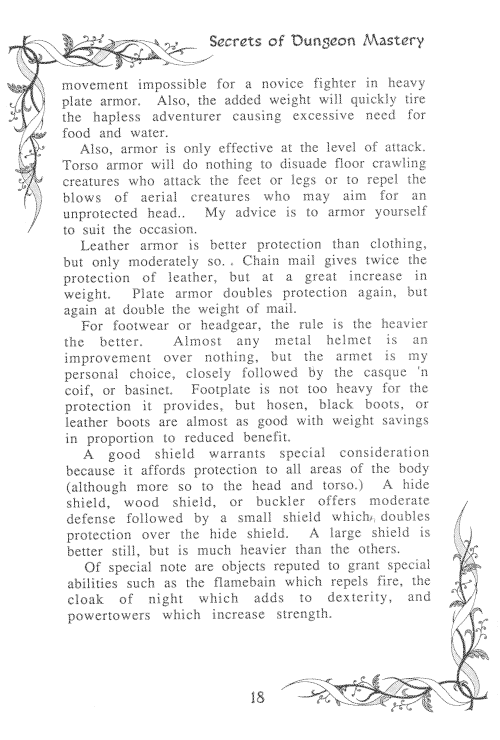 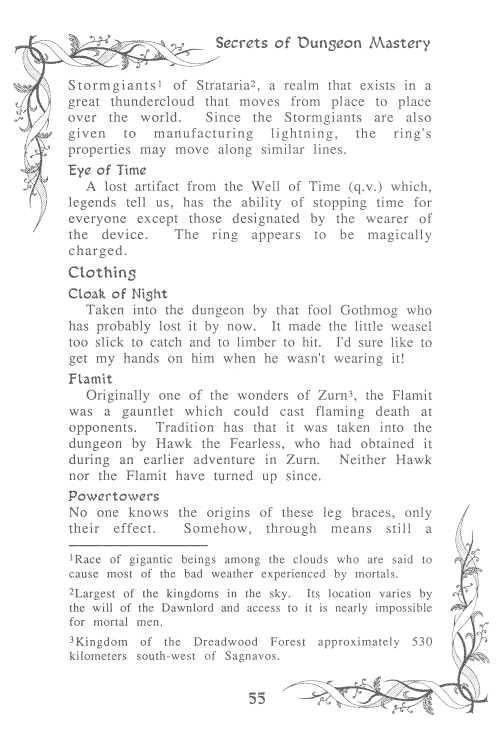 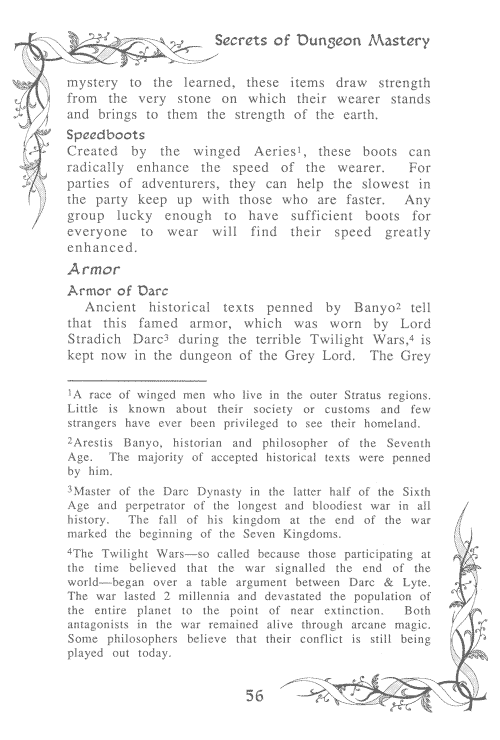 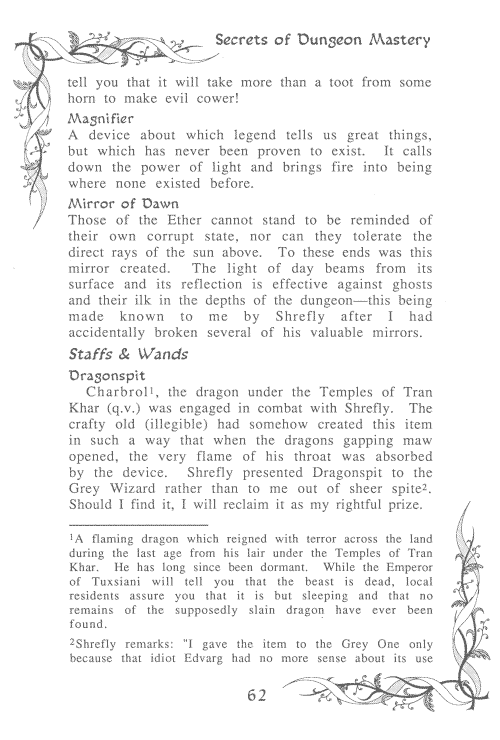 At the end is an extra section which lists some of the items which may be found in the game, including objects such as the Eye of Time and Speedboots and various pieces of armour and special weapons. 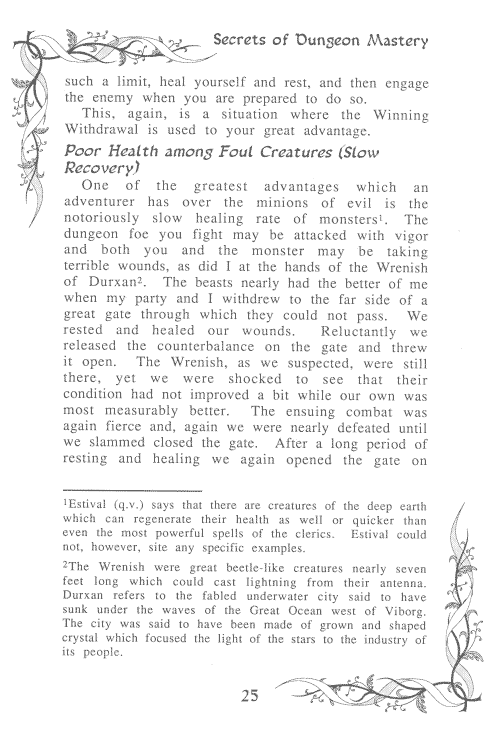 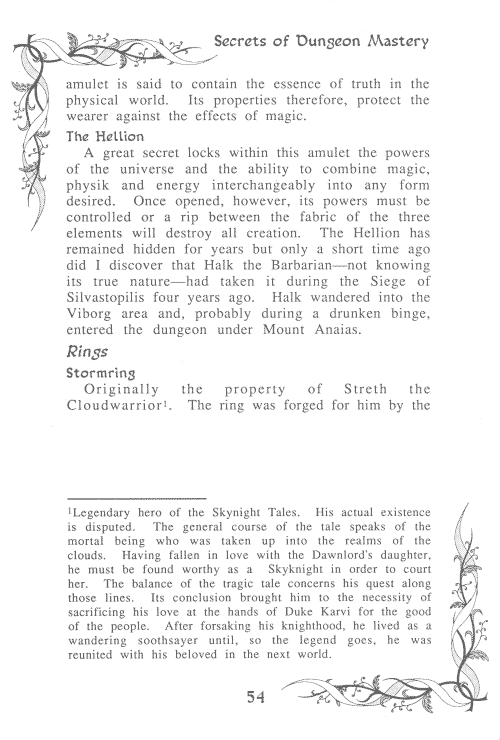 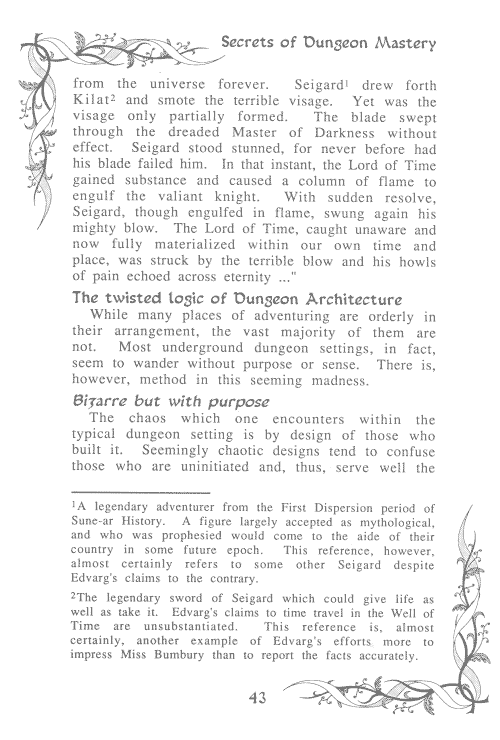 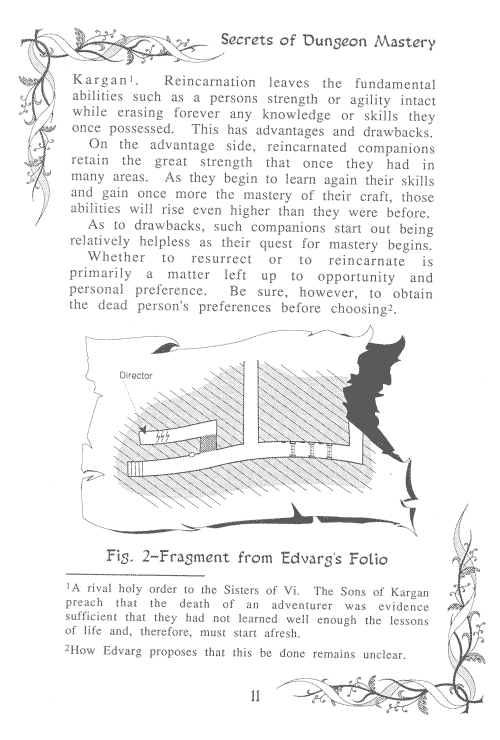 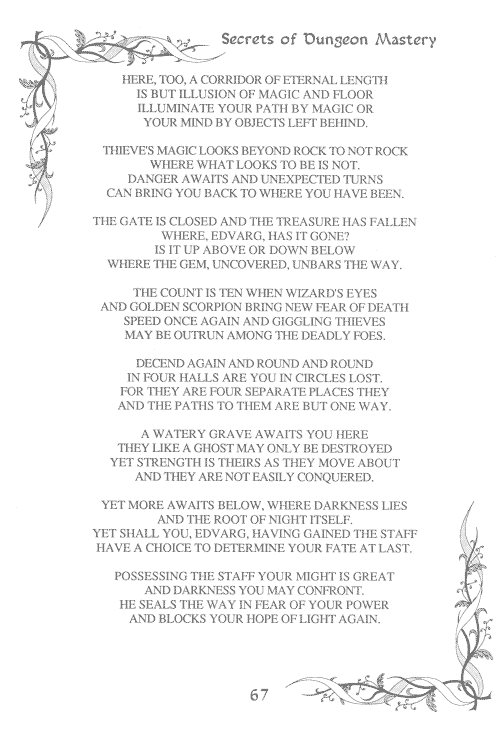 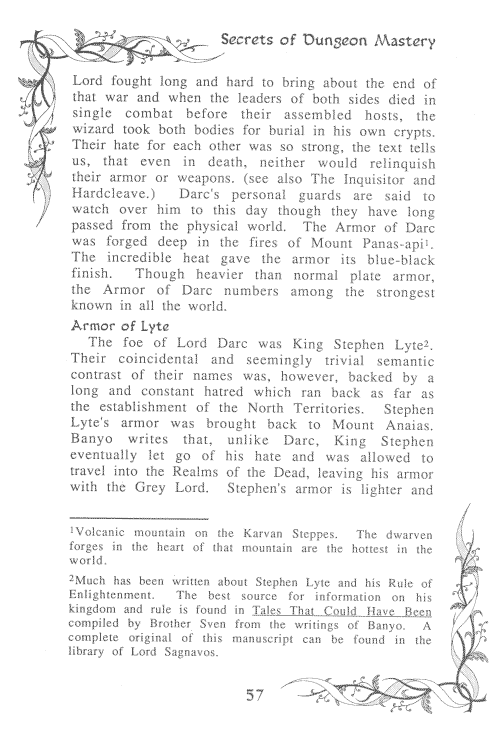 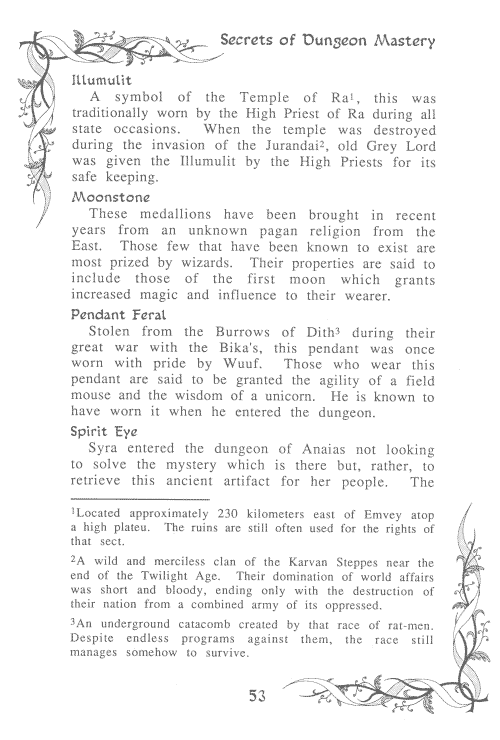 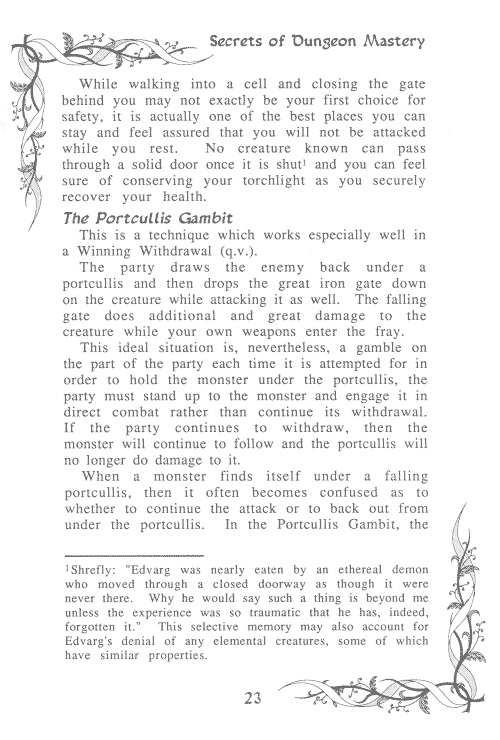 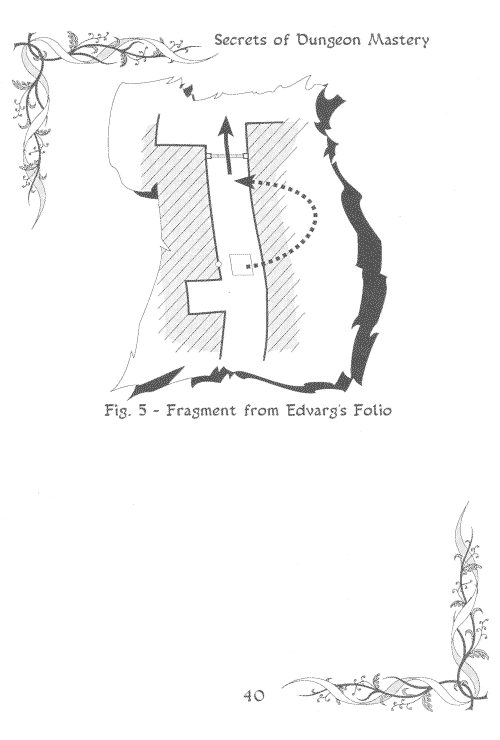 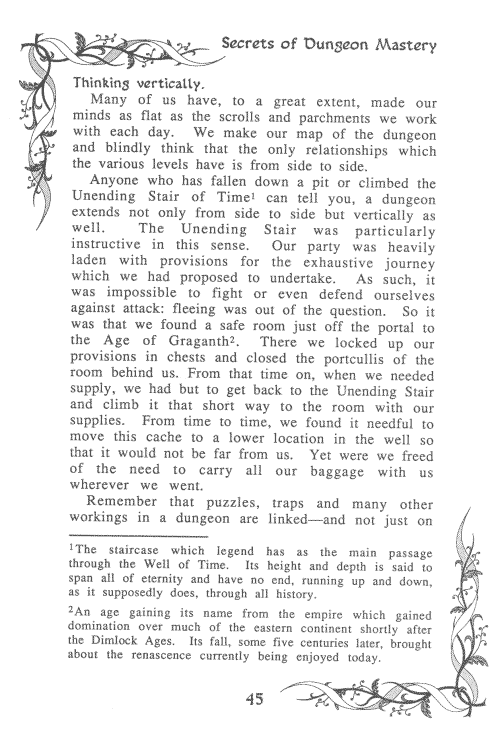 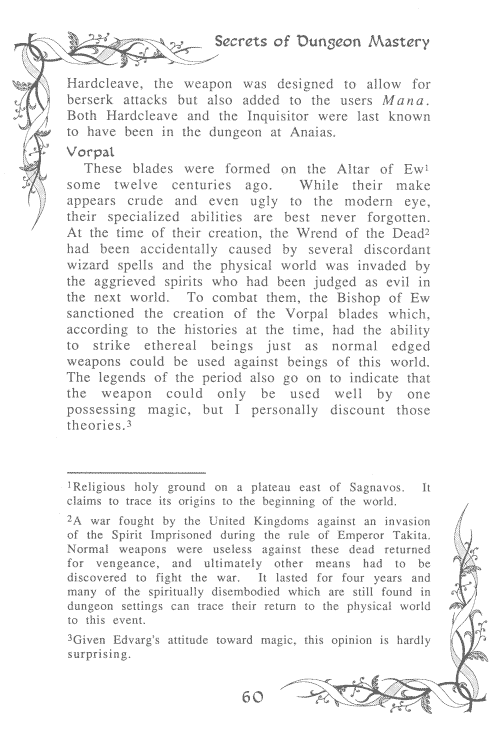 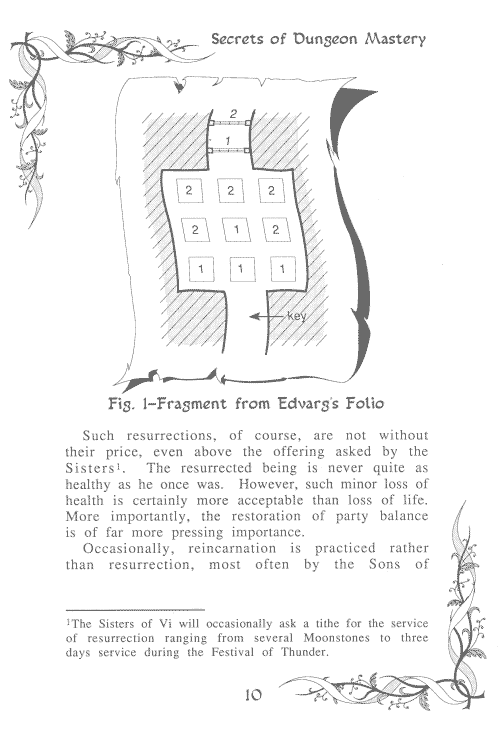 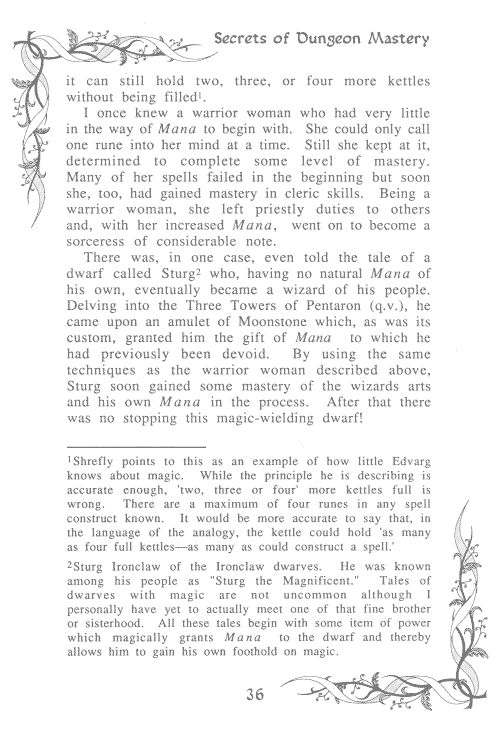 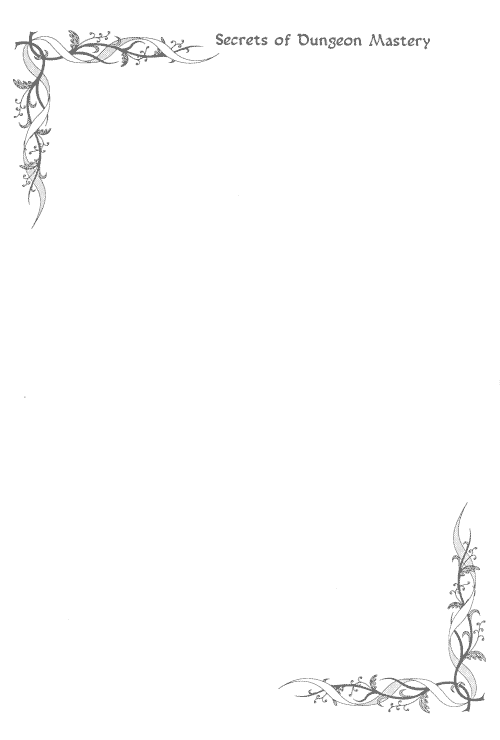 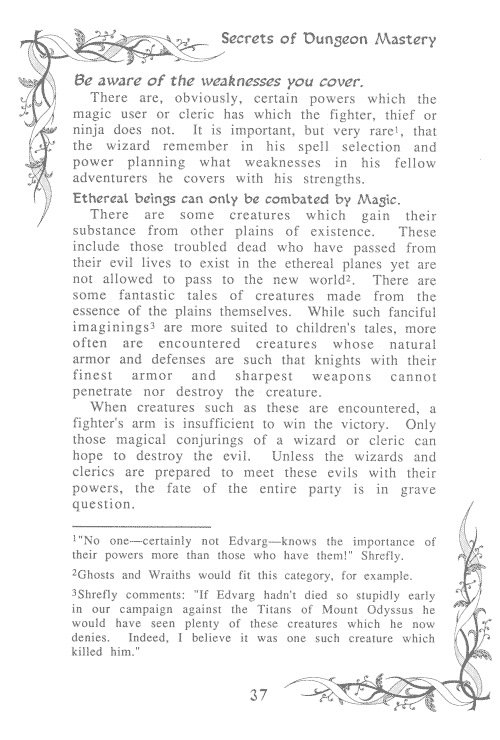 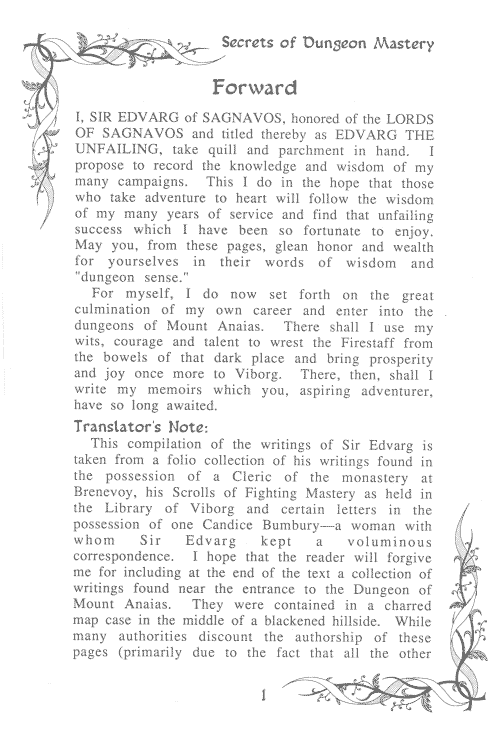 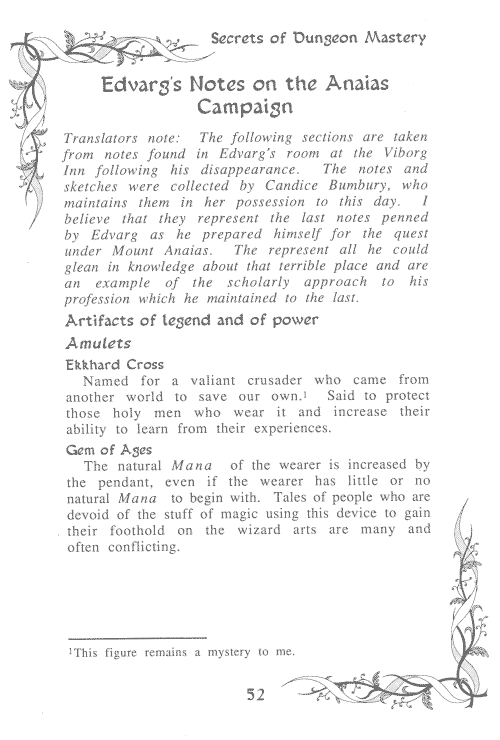 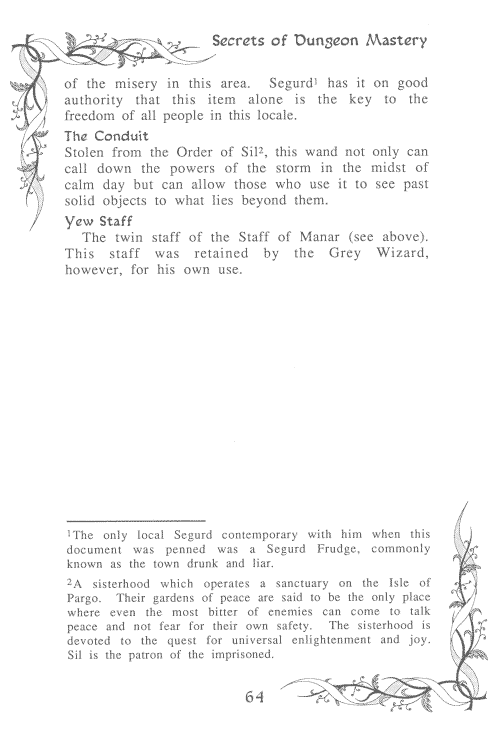 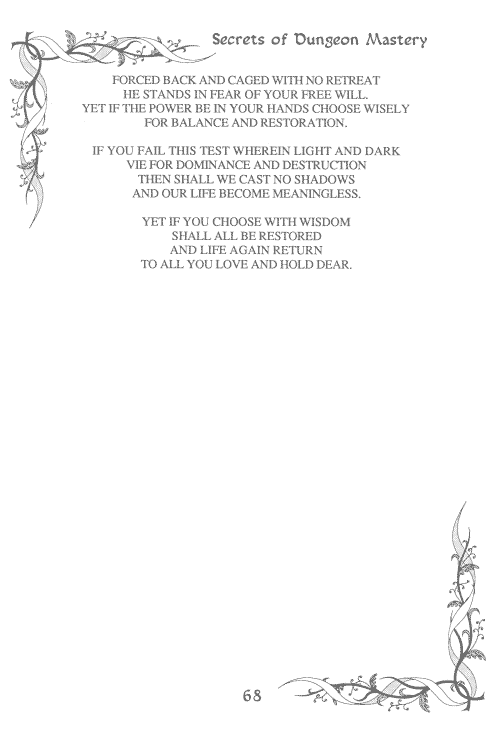 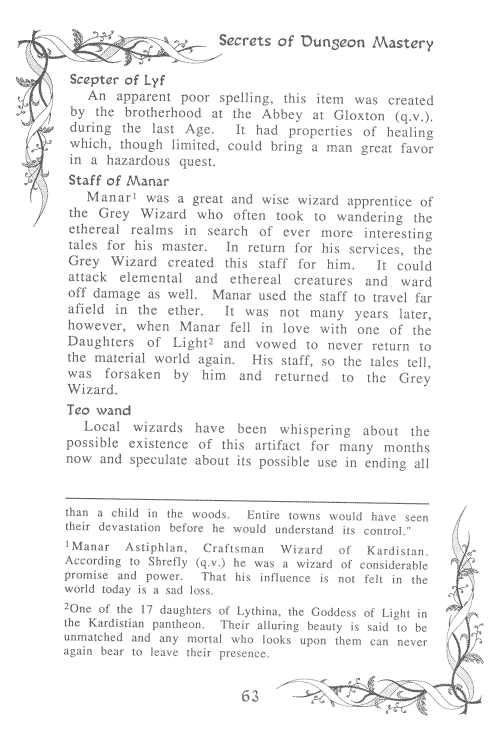 There are also three pages of verses, said to have been prophecies given to Edvarg by an unknown soothsayer before his fatal descent into the dungeon. 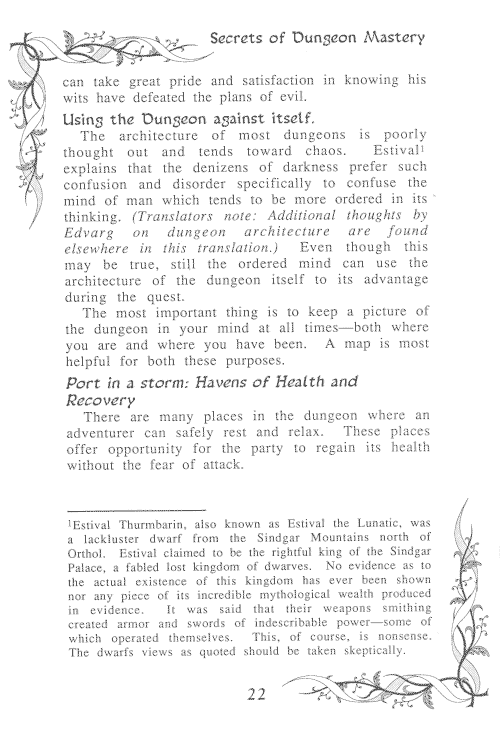 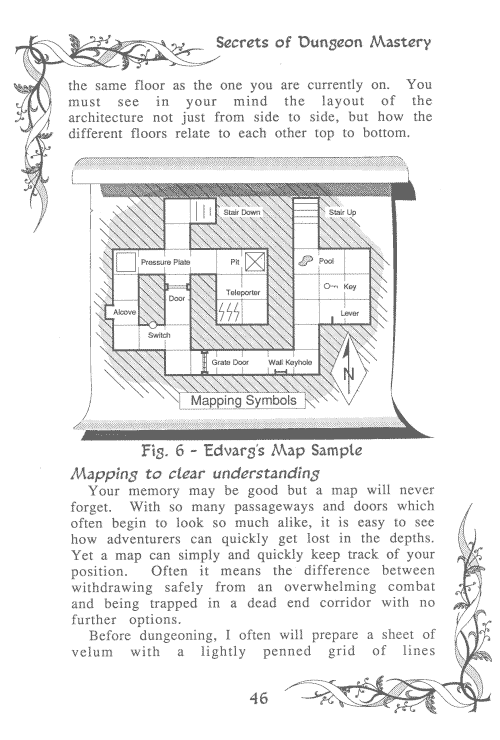 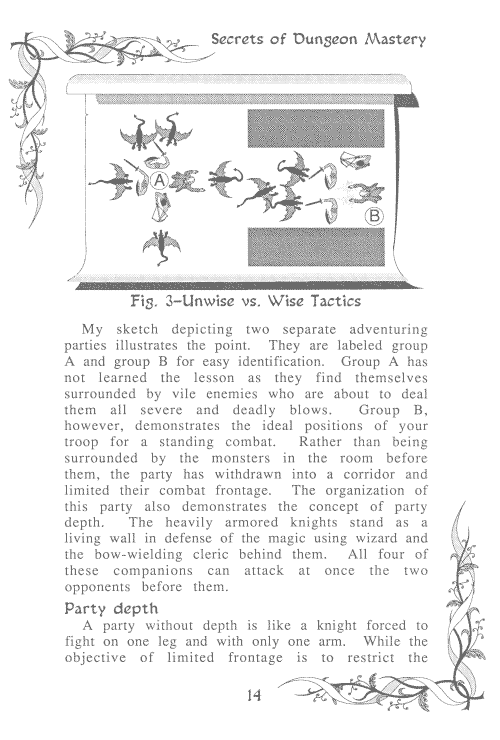 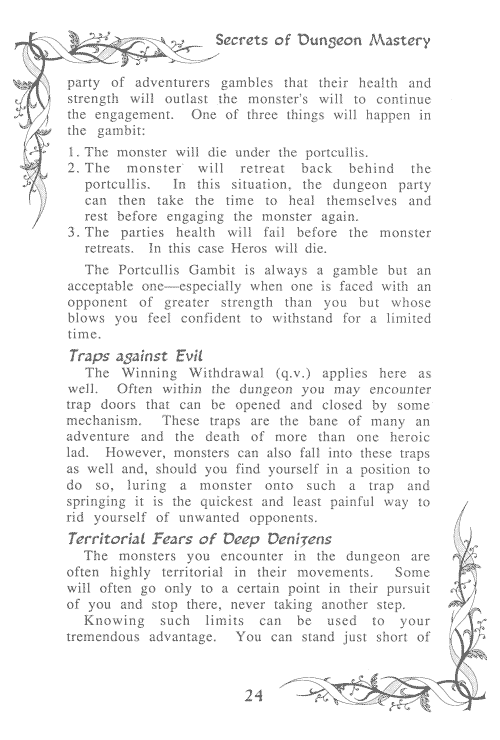 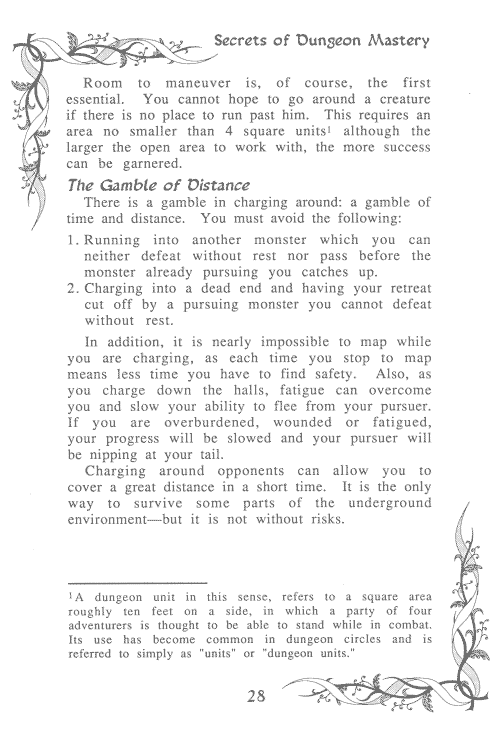 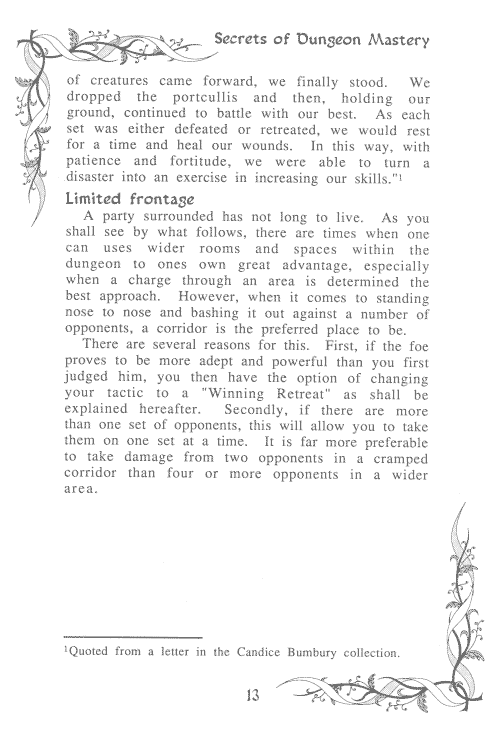 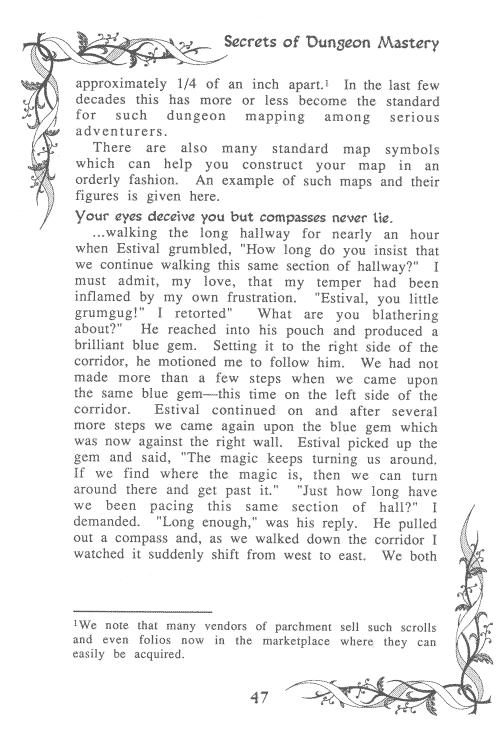 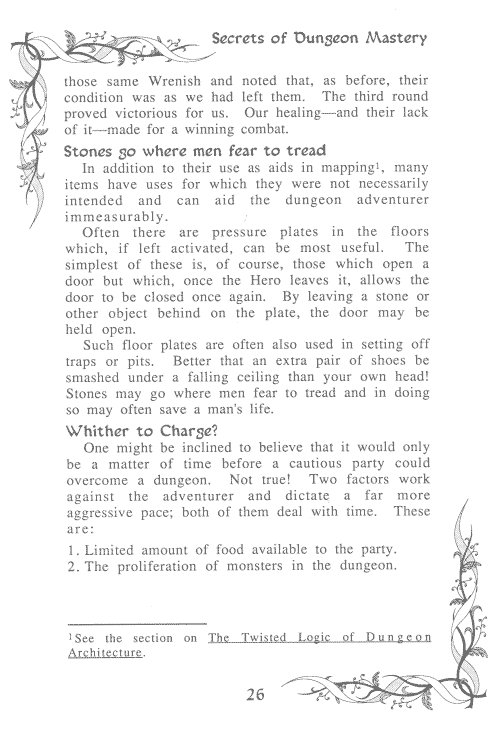 Dotted through the book are a few line-drawings to show maps of part of the dungeon, tactics in fighting and a way to get extra Mana. 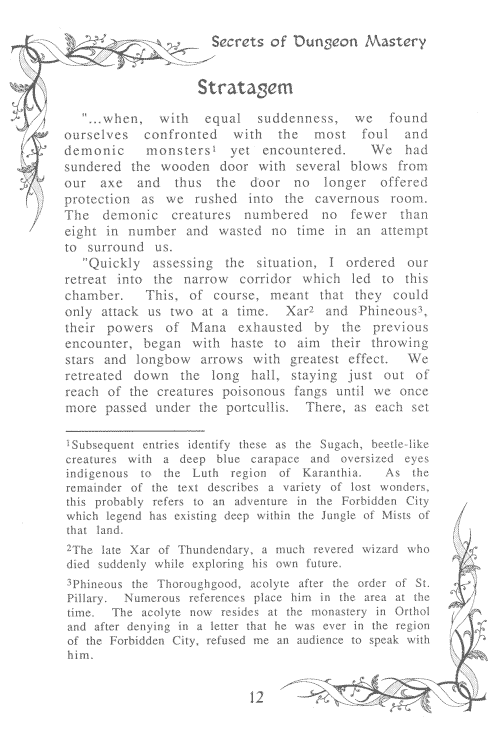 The book is also littered with footnotes which may either clarify a point in the text or expand on the story being told. 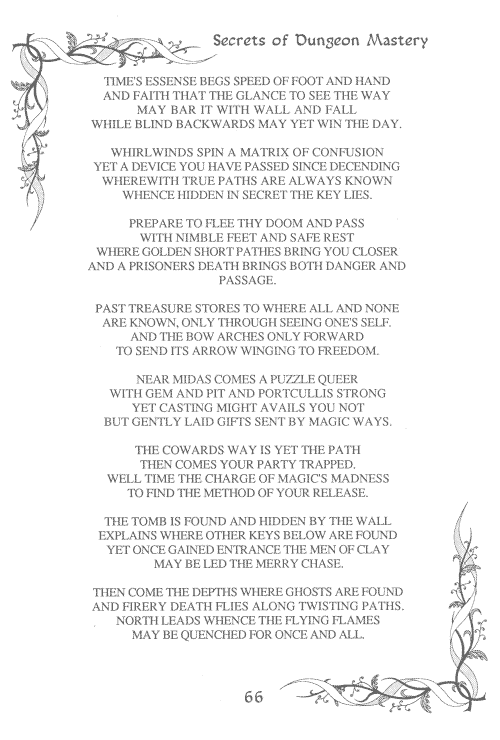 For it IS a story. 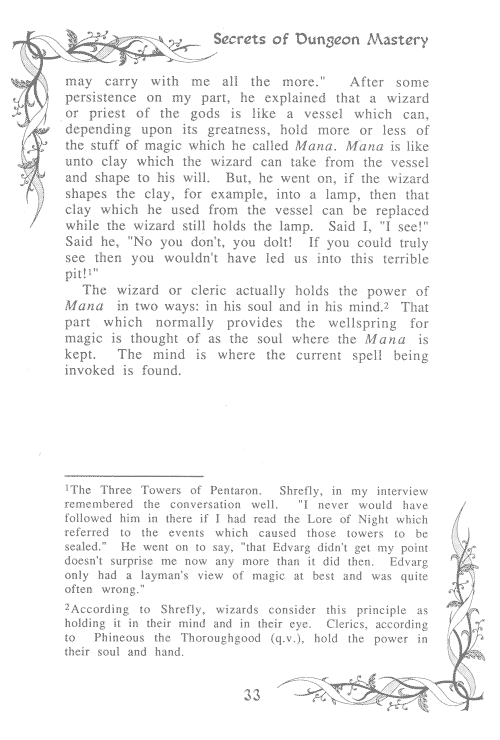 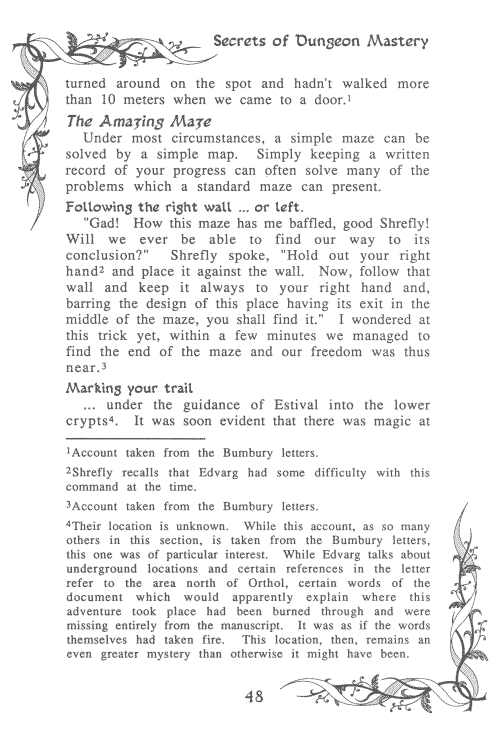 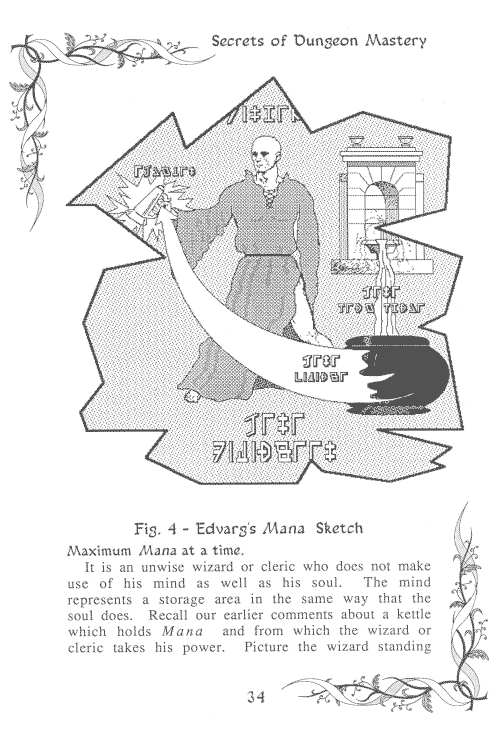 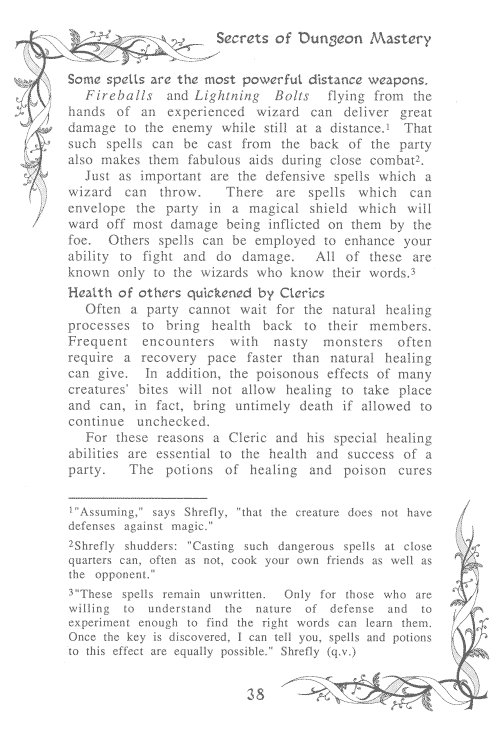 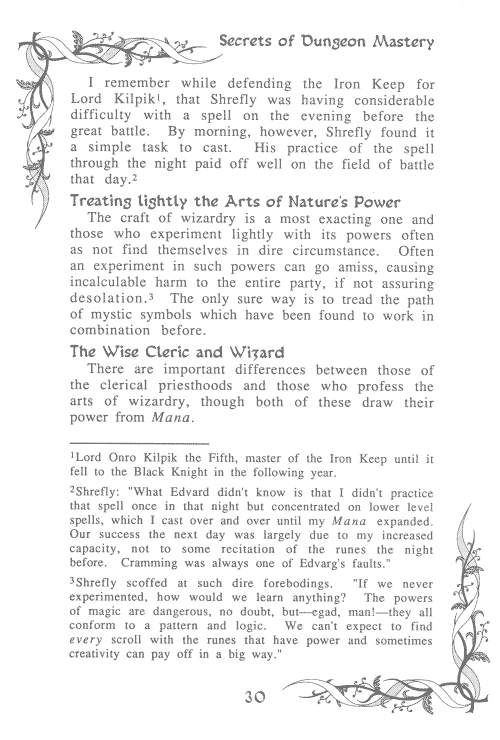 The style in which it is written is very flowery and extra characters (Shrefly the Wizard, Streth the Cloudwarrior) and places (The Well of Time, Strataria), together with any extra details to bring life to the tale, are continually being introduced. 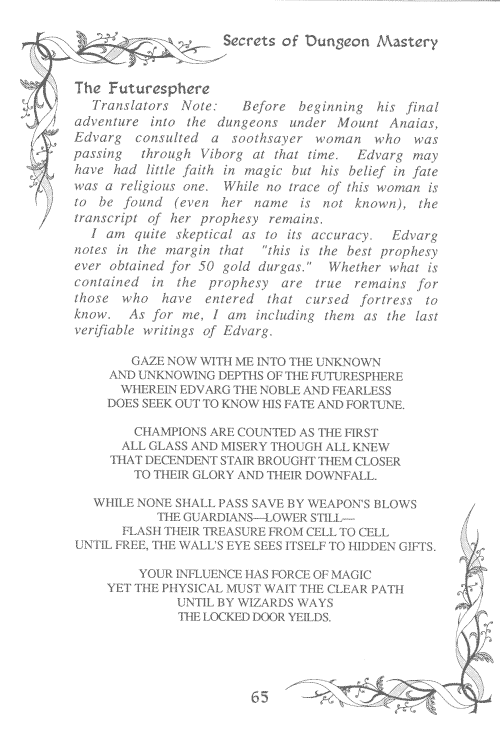 This can, at times, make it a bit of a struggle to read. 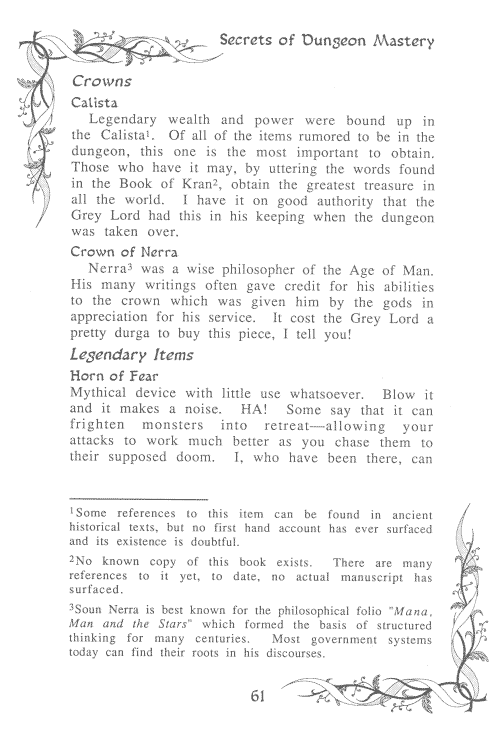 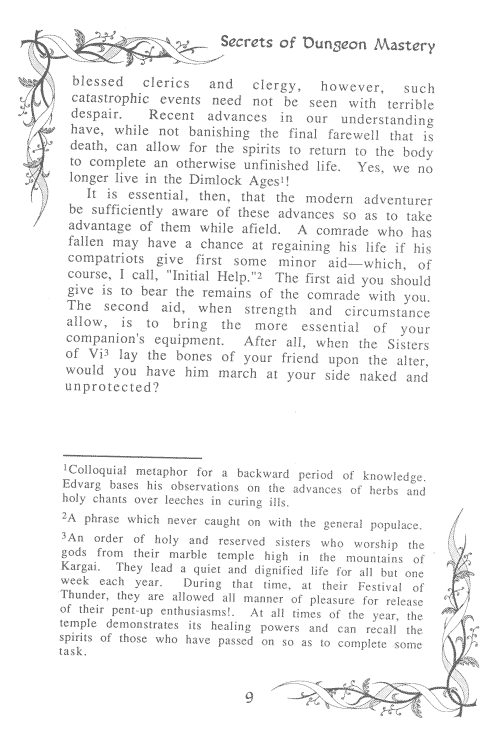 The main text is alright, but those footnotes .... 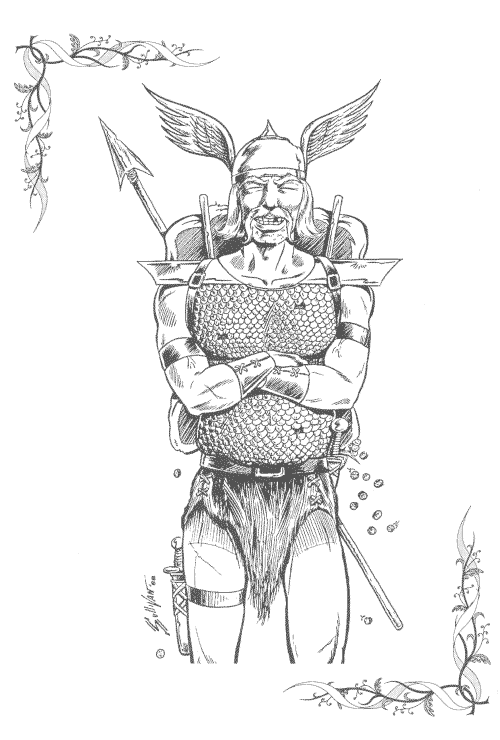 argh!.... 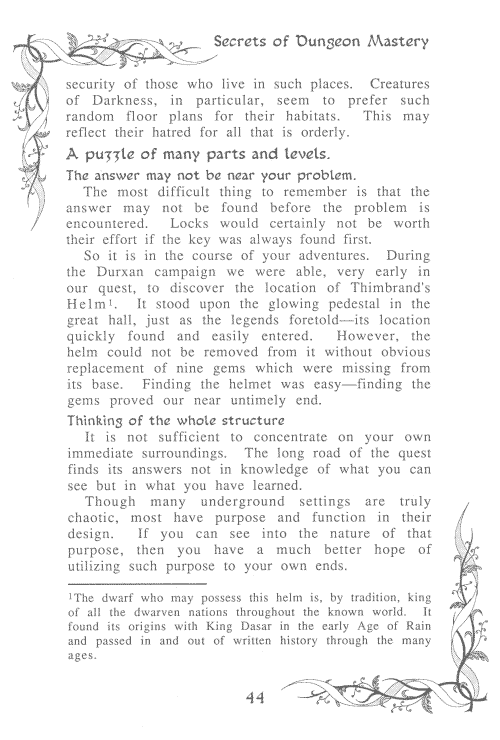 Though it's tempting to miss out the footnotes, if you do you will run the risk of missing out on some valuable bits of information which are hidden amongst the legends. 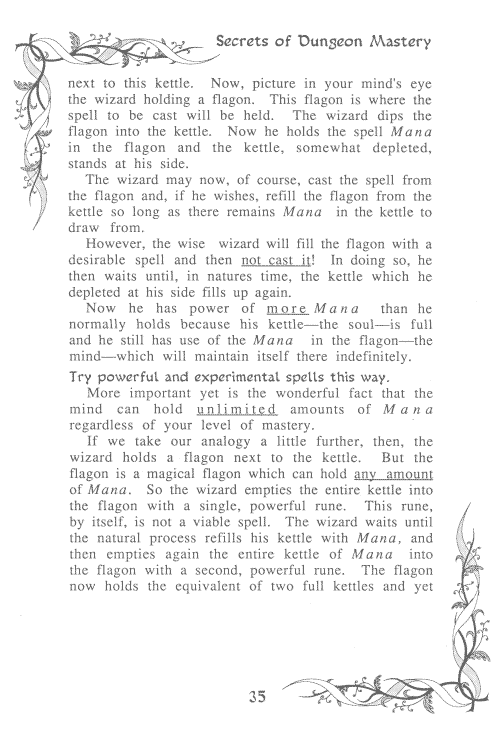 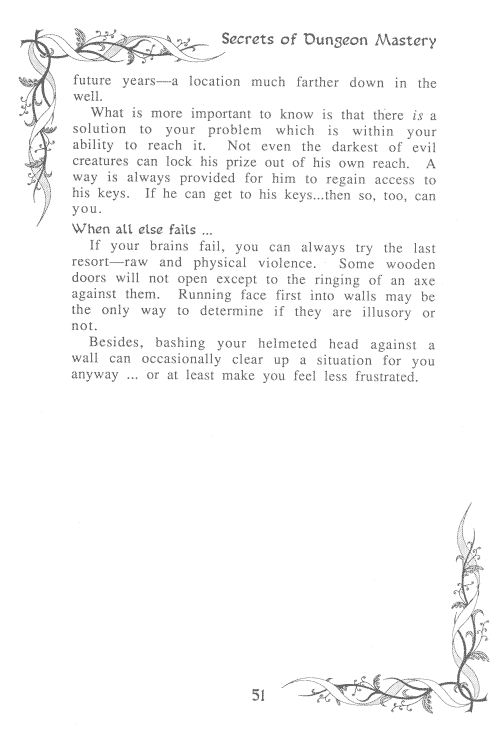 The whole book is written very cryptically so don't expect a step-by-step solution to problems that have you baffled. 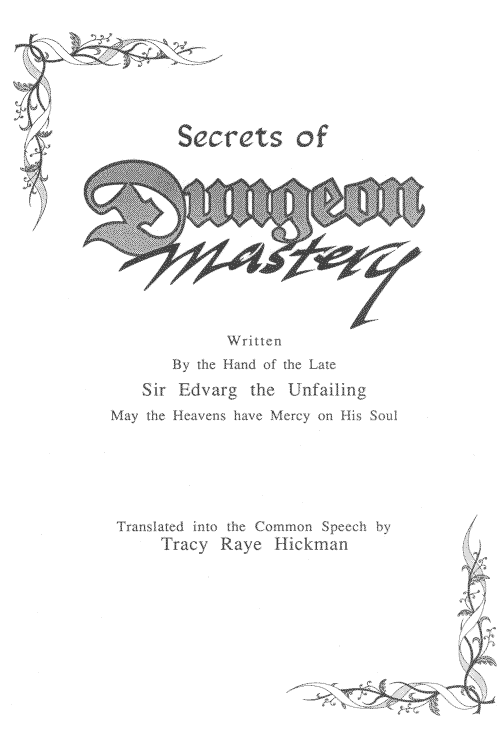 However, even with my limited knowledge of the game, I found it a very enjoyable read (despite several spelling mistakes) and I learnt quite a few things which will definitely be to my advantage when I find the time to get back to the game!